We have full-service swimming pool chemicals to help you keep your Spartanburg pool looking great. Full-Service Swimming Pool Chemicals in Spartanburg – Part of owning a swimming pool is keeping it clean and safe to swim in. At Ricky’s Pools, we have full-service swimming pool chemicals to help you keep your Spartanburg, South Carolina pool looking great. Learning how to use pool chemicals safely and effectively is an important part of pool ownership. If you have any questions about the use of any particular chemical, we are happy to help and can direct you to the right chemicals for your pool’s needs. Keeping your pool water within an ideal pH range is necessary for safe swimming. If the pH is too low, the water becomes acidic and will burn through your chlorine supply faster and cause corrosion on plastic and metals in the pool. If the pH is too high, it will make the water look cloudy or murky. This decreases the effectiveness of chlorine in the water, requiring you to add more chlorine to make the water sanitary to swim in. Our supply of full-service swimming pool chemicals can help you maintain a proper pH level in the water, decreasing your need to use more chlorine and keep your pool safe to swim in. Another common problem with swimming pools is algae growth. Fighting algae growth is an ongoing maintenance task, but if you use an algaecide to keep algae growth at bay, it is typically easy to manage. Excessive rainfall or increased use of the pool can result in algae growth, so it’s helpful to keep an eye on the pool after a storm or a party. 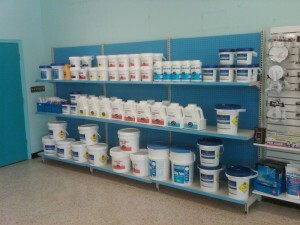 At Ricky’s Pools, we have full-service swimming pool chemicals for any pool needs you might have. Contact us today for more information.